Chairman of the Joint Chiefs of Staff Instruction 3121.01B, Standing Rules of Engagement (SROE)/Standing Rules for the Use of Force (SRUF) for U.S. Forces, dated 13 June 2005 are the result of a review and revision of the previous 2000 and 1994 editions. They provide implementation guidance on the inherent right of self-defense and the application of force for mission accomplishment. They are designed to provide a common template for development and implementation of ROE for the full range of military operations, from peacekeeping to war. Outside U.S. territory, the SROE apply to all military operations and contingencies. Within U.S. territory, the SROE apply to air and maritime homeland defense missions. Included in the SROE are the Standing Rules for the Use of Force (SRUF), which apply to civil support missions as well as land-based homeland defense missions within U.S. territory and DoD personnel performing law enforcement functions at all DoD installations. 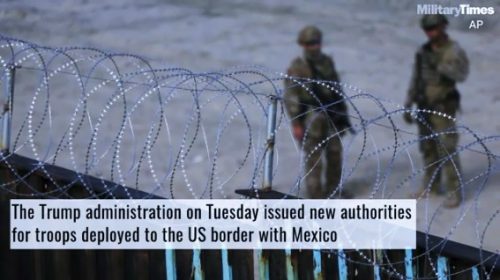 Be the first to comment on "21 – 26 November 2018 – White House approves use of force, some law enforcement roles for border troops"